I’ve been watching baseball for as long as I can remember, and I’ve been watching baseball seriously--and with a discerning eye--for the past decade or so. And in that time, I don’t recall any season in which professional umpires have made so many errant calls. Sure, bad calls are very much a part of the game (and therefore I am absolutely against instant replay in any fashion) but this year’s list of blown calls seems excessive. The biggest (and worst) such call so far this season cost a young pitcher a perfect game, and it seems like not a week goes by without some controversy or another concerning a close call, or an umpire, or both. Interestingly enough, a pattern formed early on in the year that should have clued us all into what was to come. "They're two of the best teams in baseball. Why are they playing the slowest?...It's pathetic and embarrassing. They take too long to play." Too long to play? A baseball game? I’m sure his employers at MLB loved that. A three-plus hour game between the two biggest rivals in all of sports? Yeah, I bet the league did pretty well with advertising during that game. Of course, it’s not about the money--for me, anyway. Baseball is a game with no time limits; no restrictions on the offensive team other than the three outs allotted per inning. Before those three outs are recorded, well, whatever happens happens. A team could score 10 runs and cause their opponents to use 5 different pitchers in the same inning. Or a team could swing at three pitches and hit three groundballs to the shortstop. That’s part of the beauty of baseball--there are no shot clocks or two minute warnings, no TV timeouts or halftimes. The game continues on until one team scores more runs than the other team, and gets 27 outs. Joe West was wrong in his comments, and, frankly, pretty stupid in saying what he said. But he sure did a fine job of foreshadowing a long, bad season for MLB umpires. And, because we haven’t had a controversial call since the weekend, an umpire Tuesday night gave us something new to talk about. In a game that featured three ejections and closer Trevor Hoffman’s record 600th career save, Tuesday night’s game between the Brewers and the Cardinals will be remembered for the following. In the 7th inning, home plate umpire Bob Davidson turned to the stands directly behind home plate...and he threw a fan out of the game. Yep. A fan. Someone who was watching a game that he paid primo money for, and heckling an opposing player. Listen, I’m the number one proponent of "Don’t be that Guy," but c'mon. You can’t throw a fan out for heckling a player. The players make a whole lot of money--they can take the heckling. And if they can't? Then find a new job. Maybe one that doesn’t pay a league-minimum of $400,000 a year. Now, let’s step back a moment. Say a fan becomes overly rowdy at a game, and he or she (probably he) starts to annoy people around him. And he disrupts other paying customers from enjoying the game. Then he should go. Absolutely. Throw him out. BUT, security should throw him out. NOT the home plate umpire. There’s a line, and in my opinion, the umpire crossed it. It’s the running joke of the 2010 season that umpires are, more and more, injecting themselves into the game. As if they want people to talk about them at the bar after the last out is recorded, instead of Alex Rodriguez or Albert Pujols. But an umpire--a good one, anyway--should be invisible. A backdrop. Like a great safety or cornerback in football, a baseball umpire should not have his name called during a game. That’s how you know he’s doing a good job. Because nobody’s said a word about him. But this year...I dunno. There must be something in the Gatorade. In an update to this story (I wrote this post on Wednesday, before the umpire in question was interviewed by the media), take a look at this article from ABC Sports, where home plate umpire Bob Davidson says that the fan (a 44-year old male) used a homophobic slur, and that's what prompted his ejection. Claiming that he feared retaliation from St. Louis Cardinals catcher Yadier Molina (to whom the heckling and slur were directed), Davidson stepped in and threw the fan out. Now, obviously, I don't side with the fan. He's an idiot, and I don't get guys who heckle players. But, since he paid for his ticket, he's allowed to heckle. Yes, the slur was clearly over the line, but I still don't think it warranted an ejection from the umpire. The fan was drunk--very drunk, according to Brewers players--and as such, he should have been escorted out by security. But, for whatever reason, security didn't think it was neccessary to throw the guy out. And their job is to know when to throw a guy out. Just to be clear--the guy's an idiot. What he allegedly said is disgusting and primitive, and I in no way agree with fans who heckle and carry on. I mean, I'm the guy who hates the guy who asks writers/artists to sign more than a couple of comic books at a convention. Go to a game, sit there, have a beer, enjoy life. But leave security to the security folks. 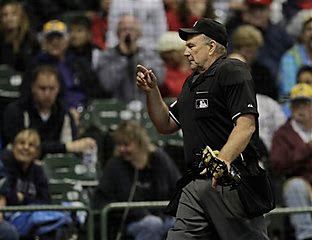 Umpires have done enough this year to make themselves way, way too noticable during Major league Baseball games. So, in conclusion--everyone please just chill out. The Dark Tower to Film and TV! Please hold... Samus Aran is on the line.